The 2018 Milan-San Remo (MSR) was a long-anticipated race after what has been an already exciting start to the year with fast and aggressive racing right from the Tour Down Under in January. The first Classic “Monument” of the year is the perfect opportunity for a team to have their season kicked off in style. With the bad weather that has battered Europe for most of the year and with the start of the race set off in the rain and cold—it was clear from the gun that the 2018 MSR was going to be a epic day. 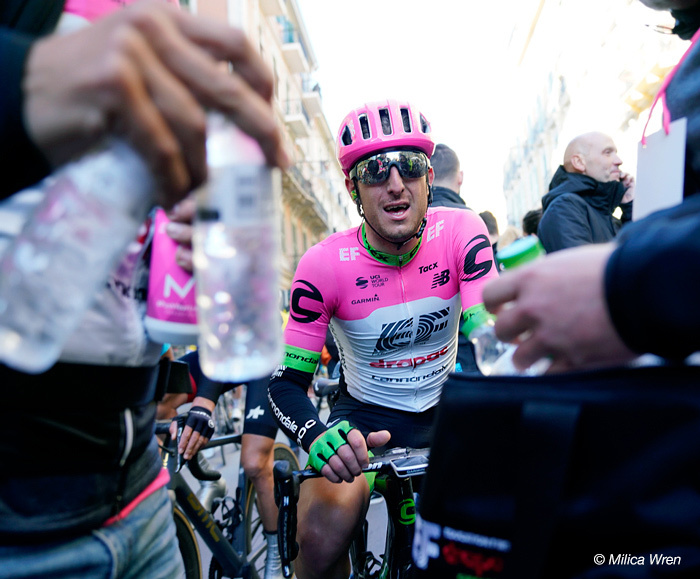 Sacha Modolo was EF Education First’s protected rider for this year’s MSR. He has had a solid start to the year, which has already seen him take a win in a stage at the Ruta del Sol and a high placing in Omloop Het Nieuwsblad in February. This meant going into the race the Italian rider had everything in place for a big result. The race did not go well prior to the final for the EF Education First team as team captain Simon Clarke and team sprinter Dan McClay both crashed with 42km to go, this left Modolo without two of his main teammates to help protect him into the crucial final climbs of the Cipressa and Poggio. In the end Sacha had the perfect positioning entering this final run into the decisive climbs and onto the finish; he made the front split of 18 riders over the Poggio as they chased the flying Vincenzo Nibali. The initial kilometers of MSR was run in a similar fashion compared to previous editions: A flurry of attacks with those riders keen enough to spend the next 200-250km in a breakaway. After just a few kilometers, nine riders broke clear and gained a quick advantage over a peloton who wanted a more sedate start to the cold morning in Milan. The pace started to ramp up in the fourth hour as the BMC lead peloton started to increase the pace and bring down the lead of the front group. Before the start of Passo del Turchino the lead group had a 6:30 minute advantage over the peloton and by the top this was reduced to 4:30 minutes. The effort can be seen in Modolo’s data as this was his real first sustained effort over 5w/kg. On the 2.2km climb he averaged a power of 404w, 5.65w/kg for 4:38 minutes. This climb signaled the approach to the coast and a point when the tensions started to rise, and the power began to ramp up along with it. The first real test along the coastal route is the Capo Berta, this climb was hit at speed, and the tension and fight for position was already causing some issues, including several crashes, which claimed two of the EF Education First riders. In the 4.7km before the Capo Berta the bunch averaged 52.4kph, the pace continued onto the climb with Modolo hitting his peak five minute power for the day on the slopes of the Capo Berta. For five minutes he averaged 416w, 5.82 w/kg—his peak five minute power for the day. The climb up the Capo Berta only lasted 3:49 minutes and he did this period at a power of 453w, 6.34w/kg. The pace on this climb was enough to see several riders get dropped, such as German sprinter Marcel Kittel. Again, the lead of the breakaway was reduced to 40 sec with the chasing peloton. We can see how this fight for position can affect the speed of the peloton by looking at Modolo’s data as he approached the famous climb, Cipressa. In the 3.2km leading to the foot of the climb he averaged 51.7kph maxing out 69.6kph for the 3:44 minutes it took him to complete this pan-flat 3.2km. During this time, he averaged 252w, 3.52w/kg, which shows that his team done an excellent job and keeping him in the wheels and keeping him close to the front without expelling a lot of energy. It is at these key sections, where smart riders are able to reserve enough energy for later in the race when a team leader’s big efforts are needed. Simply put, if a rider like Modolo has to fight for his own position and waste valuable energy during these parts of the race, his ability to make the lead group or being able to contest the sprint will be significantly impaired. The pace on the Cipressa was kept at a solid tempo with FDJ and Team Sky doing the bulk of the work to keep the group together. The lead break has been caught at this point and it was all about positioning and hoping to make any splits that might occur on the climb or the descent. Unfortunately, Modolo had an issue with his powermeter in the last half of the climb and was unable to pick up any data. The first 3km of the of the 5.63km climb were already ridden very hard, Modolo producing an effort of 396w, 5.54w/kg for the 6:09 minutes. Looking at the speed of the climb, it can be assumed that this effort was at least maintained for the rest of the 2.5km, which still had to be climbed. This climb may not have been decisive for the outcome of the race—no attacks were placed—but it did see several riders burn a lot of matches and force them to use up valuable energy, which they would lack later in the race. This would have been the aim of FDJ and Sky, riding for Arnaud Démare and Michal Kwiatkowski, respectively, as they pressed to keep the tempo high and the group together before the Poggio. With the race now heading for the final climb of the Poggio, it was again down to the domestiques to keep active at the front and help their designated leaders maintain a good position, so they could unleash their attacks or respond to moves on the twisting road of the Poggio. If we look at Modolo’s data for this section, we can see a similar effort to that made before the Cipressa. On the 6.2km-long approach to the bottom of the hill, Sacha achieved an average speed of 47.4kph and maxed out at 64kph. During this period Sacha averaged “just” 253w, 3.54 w/kg, but he hit peak efforts between 600w and 900w for eight times, as he fought to stay close to the front. 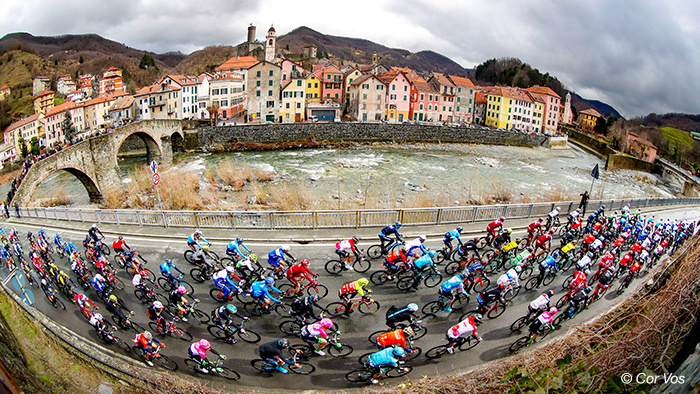 The showdown was set for the Poggio with all the main players to the fore. The twisting turns on changing gradients between 2 percent and 8 percent make the perfect stage for a long-range attack to the final victory. This is where Vincenzo Nibali launched his attack in the final 2km of the climb on the steeper sections. If we break it down further, we can see the effort he needed to hold onto the group as the approached the top of the climb. This would have been a very uncomfortable last 900m as the effort needed to hit nearly 6.5w/kg for a prolonged period after already having done over four minutes at 5.4w/kg (never mind the 285km ridden to this point). The run into San Remo was ferocious as Nibali was taking many risks on the descent to keep his slender lead of 10 to 12 seconds. On the descent Modolo did everything to maintain contact with the lead group. 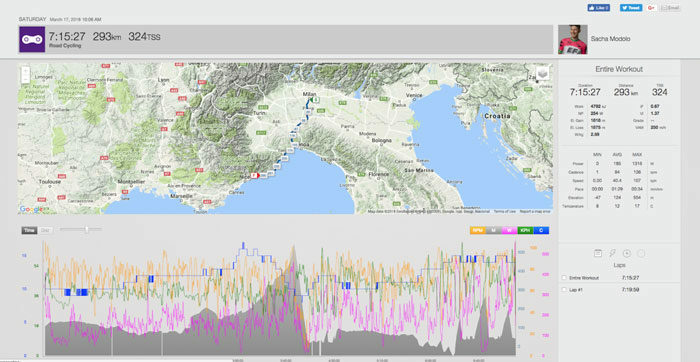 What is very interesting is the high intensive anaerobic efforts done during the 3km downhill off the Poggio. On the 11 sharp turns which greeted the riders as they negotiated the twisting road, Modolo had to make just as many efforts lasting between four and 12 seconds and ranging from 700w, 9.8w/kg to 1316w, 18.4w/kg. These sprints out of each bend where required every 10 to 20 seconds, leaving very small windows for rest, which shows how incredibly difficult it was to stay on the wheels and hold position. On one 10 second jump out of a bend he hit an impressive peak power of 1316w and averaged 976w, 13.7w/kg. As the riders hit the final 2km in the run into the finish, the chase was still on for the lone leader, and at this time Modolo was doing his best to position himself in the final. In the final 2km Modolo averaged 392w, 5.48w/kg for the 2:19 minutes it took him to cover this distance. In the final dash as the main group desperately tried to catch Vincenzo Nibali, Modolo still averaged 756w for the final 150m maxing out at 1072w, 15w/kg and hitting a max speed of 64kph. Another impressive effort after over seven hours in the saddle and a true test of endurance to be able to perform so highly in a very intensive final to the race.